Libations left over: Make yourself a cocktail if you feel so inclined. I'll be heading out to Oak Glen this weekend to pick a couple crates worth of apples (I'm a Michigan girl at heart), but I couldn't resist making an apple pie a couple weekends ago for a Lush Chef family dinner. My mom makes the most amazing Dutch Apple Pie, but since this was a dinner filled with libations, I had to find a way to sneak something in. Apples and brandy just work so well together (hello, Applejack! ), so I tossed that in with the apple mixture. The alcohol content burns off in the baking, but the brandy gives it another small depth of flavor. You can have your cake brandy and eat it too. - Cut shortening into small pieces. - Add flour and salt. - Slowly add cold water 1 Tbs at a time and work into mixture until dough comes together. - Roll out and place in a 9" pie dish. - Preheat oven to 450. - Mix apples, sugar, cinnamon, brandy and 2 Tbs flour. - Pour into a 9" unbaked pie shell. - Bake pie for 10 minutes at 450. - Mix butter, brown sugar and 1 cup of flour and use your hands to crumble the mixture. 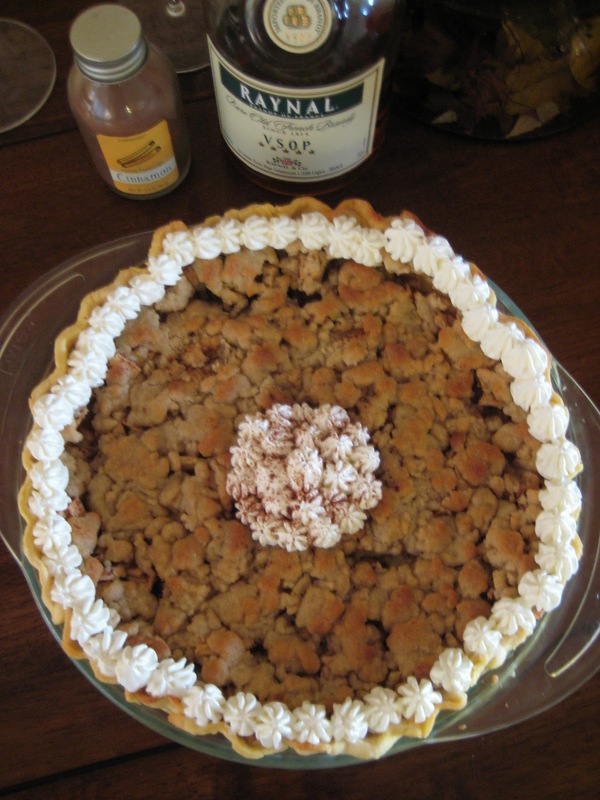 - Take pie out and drop the temperature down to 300. - Put edge protectors on pie and sprinkle crumble mixture on top. - Bake for 20-30 minutes and test for doneness by poking fork through (the apples should be soft and tender). - Garnish with whip cream (I sprinkled a little cinnamon into it).